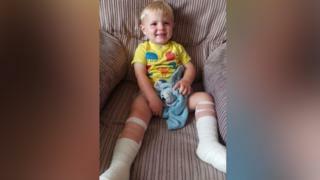 A mother has spoken of her horror after her two-year-old son was left badly burned at a beach when he stood on a hot barbecue. Laura Ashford and her son Harri were at Caswell Bay in Gower, Swansea, on Saturday when he suddenly sat down and started screaming. After realising what had happened, Miss Ashford rushed Harri to hospital. Harri's injuries will take weeks to heal and is unable to put any weight on his feet. Surgeons and environmental groups are now warning of the dangers of not disposing of barbecues properly. "I was horrified upon seeing his injuries and obviously incredibly upset," said Miss Ashford, whose father and sister were also at the beach enjoying the nice weather. Harri had been collecting stones to paint at home - and later hide them for people to find in a random act of kindness - when he unexpectedly stood on the smouldering charcoal. "I was panicked but have completed first aid training and knew his feet needed to be immersed in water. "My thoughts were to get his wounds in water and then to get him to hospital as soon as possible." Miss Ashford rushed Harri to Singleton Hospital in Swansea before he was transferred to the burns unit at nearby Morriston Hospital. "His blisters had to be burst and the damaged skin scraped off," added Miss Ashford. "He has had his dressings changed daily to date and he has been amazing each time - we are very proud of his bravery and resilience." Miss Ashford, who thanked hospital staff for their kindness, added that she now wanted more awareness of the dangers of using barbecues and fires on the beach. "There is a barbecue bin at Caswell, a tap and an ocean," she added. "Harri isn't the first child to be injured in this way but I hope that by raising awareness he will be the last." "What generally happens is the portable barbecue is used for cooking and then disposed of to prevent injury," said surgeon Sarah Hemington-Gorse, of the Welsh Centre and for Burns and Plastic Surgery at Morriston Hospital. "But then people walk, kneel or lean on the surface and sustain a burn. These burns vary in depth from partial thickness which will heal with dressings, to deeper injuries." Is it anti-social to use barbecues in parks?